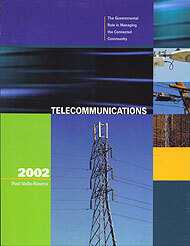 First published in 2002, Paul’s book remains a standard desk reference for planners and attorneys in the U.S. for all phases of governmental involvement in telecom law and policy. Paul was also one of the national deans of municipal telecom law lawyers, never shying away from a juicy telecom law or policy battle. A true giant among municipal attorneys, Paul rose through the ranks ultimately serving as the City Attorney of the City of Walnut Creek, California (where he was born and raised) until his untimely death in 2011 at the far-too-young age of 52. Paul was also one of the national deans of municipal telecom law lawyers, never shying away from a juicy telecom law or policy battle. Material portions of 9th Circuit judge-made law can be traced to Paul’s cases, and the influence he exerted in cases argued by others. I had the very real privilege of being a principal reviewer and contributor to Paul’s book, so you’ll understand why I am so proud to be following in his footsteps. I especially thank his widow, Alice (known to some as “Honey Sponge Cake”) for making it possible for a new edition to come about. Paul was my friend, mentor, teacher, and critic. I could not have asked for more from him. I know that Chris and I will do him and his memory real honor as we take on our task to continue his work. I’m thrilled to hear this news — so great that you will be taking on this important work.